As any true rock and roll fan knows by now, the biggest healthcare news of the week comes from New York City, where Mick Jagger is recovering comfortably after having a heart valve replaced. We’ve discussed transcatheter aortic valve replacement (TAVR) previously in the Weekly Gist, and now the revolutionary, minimally-invasive technique is getting a big moment in the spotlight, as it will not only allow Jagger to be up and around in a few days, but back on tour with the Stones by July! Here’s hoping for a full recovery, and that the surgeons didn’t have too much trouble with that Heart of Stone. What happened in healthcare this week—and what we think about it. Reversing course in the face of strong pushback from his own party’s leaders in Congress, President Trump this week backed off his earlier pledge to deliver a Republican healthcare plan to replace the Affordable Care Act (ACA). After the Department of Justice switched positions on the Texas court case testing the constitutionality of the ACA, urging the Fifth Circuit Court of Appeals to invalidate the 2010 law entirely, Trump doubled down by declaring that Republicans would be known as the “party of healthcare”, going so far as to tap four GOP senators to craft a replacement bill. However, the White House received a rare rebuke from Senate Majority Leader Mitch McConnell (R-KY), who said this week that in private discussions with the President, “I made it clear to him that we’re not going to be doing that in the Senate.” In tweets and a subsequent speech, Trump signaled his frustration with Congressional Republicans on the issue (“We blew it the last time. Man, I was fed a bill of goods.”), vowing to return to the issue after the 2020 elections. By highlighting GOP divisions on the issue, this week’s public dust-up and Presidential about-face all but guarantee that healthcare will be a marquee issue in the upcoming elections, allowing Democrats to campaign on an issue that proved a strong suit for them in the 2018 midterms. Expect the politics of healthcare to remain front and center in the months to come. Medicare Advantage (MA) plans got a better-than-anticipated pay hike this week, as the Centers for Medicare & Medicaid Services (CMS) released its final 2020 policy and payment updates for the private coverage program for seniors. MA payments will increase by an average of 2.53 percent in 2020, higher than the 1.59 percent initially proposed by CMS earlier this year, reflecting CMS’s expectation that MA services will grow faster than it initially thought. With the announcement, CMS is also finalizing plans to allow reimbursement for supplemental, non-clinical services covered by MA plans, such as transportation, nutrition support, and housing improvements, as long as those services are intended to improve health status. The final update also confirms CMS’s intent to continue updating its risk-adjustment methodology to more accurately reflect the intensity of services delivered to beneficiaries, a change that has been controversial among insurers, who fear the new methodology will result in lower payments from the government. Despite these concerns, shares of MA insurers traded higher after the CMS announcement, and health plans will no doubt be pleased with yet another year of good news from CMS on MA rates. Given continued strong enrollment growth, robust rate increases, and a pipeline of millions of aging Baby Boomers poised to become eligible for Medicare, large insurers (and increasingly, providers) will view MA as their primary source of growth for the next decade or more. Amazon announced this week that the toolkit software developers use to build “skills” for its voice-enabled devices is now compliant with US health privacy law, opening the door for many more healthcare applications for the ubiquitous Alexa gadgets. By making the “Alexa Skills Kit” compliant with HIPAA (the privacy law), the move allows Amazon’s devices to be used for the secure transmission of sensitive patient data, making it possible to use the voice assistant in a wide variety of clinical settings. Amazon refers to the tasks the Alexa devices can perform as “skills”, and in a blog post this week the e-commerce giant highlighted a number of new capabilities that it worked with healthcare companies to develop. For example, it collaborated with Charlotte, NC-based Atrium Health and Renton, WA-based Providence Health & Services to allow patients to find and schedule visits with local urgent care centers, and with Boston Children’s Hospital to enable parents to communicate with pediatric care teams. According to the company, the chance to develop Alexa skills that are HIPAA-compliant will be granted by invitation only. With more than 100M Alexa devices sold, demand among developers looking to build consumer-friendly healthcare tools is sure to be high. Beyond consumer applications, the combination of Amazon’s voice tools with its existing software that can mine and analyze electronic health records could spawn a major shift in how doctors and others do their work. While the initial use cases for Alexa announced this week seem somewhat limited, Amazon has taken yet another step toward becoming a significant force in the healthcare industry. A key insight or teaching point from our work with clients, illustrated in infographic form. Health Value March Madness – It’s the Final Four! 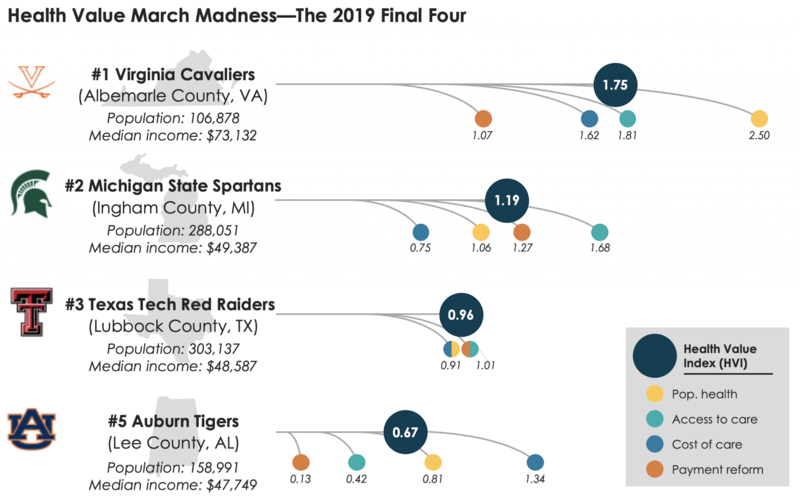 We’re back this week for the final installment of our Health Value bracket, taking a look at how the Final Four schools would stack up if the matches were decided based on healthcare value instead of skill on the court. The graphic below shows the scores of each team’s home county on our Health Value Index (HVI), which combines four domains of health data—access, cost, payment, and population health. In last week’s Sweet Sixteen matchups, fifth-ranked Auburn ousted our top-ranked HVI performer, the North Carolina Tar Heels. In this final round of HVI matchups, top-seed University of Virginia easily bests the Tigers, who have the lowest HVI score in the Final Four, pulled down by lower-than-average scores on access (with lower-than-average access to healthy food, and primary care and mental health providers), and payment reform (driven by the limited commercial competition in the state, with Blue Cross Blue Shield of Alabama controlling 93 percent of the market). Auburn does boast the best cost of care score of the Final Four—perhaps because it’s the only market without a large research-based medical school and teaching hospital. Michigan State versus Texas Tech is a tighter matchup, but the Spartans, with better-than-average access to primary care and mental health providers, oust the Red Raiders, who are pulled down by Texas’ high uninsured rate. We’re picking University of Virginia to win it all, with Albemarle County’s high HVI driven by strong access to primary care and excellent population health stats. We’d bet the area’s (comparatively) low rates of diabetes and obesity are also correlated with its high median income—a whopping 50 percent higher than the other three teams. What we learned this week from our work in the real world. The beginnings of a wave of physician secession? This week I got a message from a physician who is a member of a health system’s employed medical group. He’d come across my quote in a story that aired on Charlotte, NC’s NPR affiliate WFAE discussing the recent exits of large groups of doctors from two health system-sponsored medical groups in that market. When we connected over the phone, he said, “Splitting off from the health system is something that doctors joke about over beers. Is this for real, and how were they able to do it? Where else is this happening?” From our perspective, the situation in Charlotte is unique—we haven’t seen another market where dozens of doctors have “seceded” from an employed group en masse to return to independent practice. But we wouldn’t be surprised to see others. A general sense of practice fatigue has made some doctors antsy, and more open to exploring other options. And it’s hard for employed doctors to ignore the big dollars being commanded by large, independent physician practices from payers and investors. Given the depth of integration and shared infrastructure, exiting an employment arrangement today is far more complex compared to twenty years ago, when it was almost as easy as changing the sign on the practice door. But doctors in many markets are watching the fate of their newly-independent peers in Charlotte. Health systems whose medical groups lack an integrated identity, shared values and common culture may be the most susceptible to a possible wave of physician secession. I had an interesting conversation this week with the CEO of a regional health system who was wondering if she should explore starting an “innovation fund” to invest in health technology startups. A number of systems, particularly the larger national players, have attracted attention over the past few years with their venture fund investments, aimed at giving them an early look at promising new technologies that could be adopted in their delivery organizations, and providing potential revenue upside from startups that are eventually sold or go public. In general, I’m pretty bearish on the idea of health systems trying to act like venture capitalists. As a financial strategy, it seems like a distraction, and one in which systems will be amateurs at best. Most systems aren’t going to have the right talent, or enough of it, to evaluate the number of deals they’d need to look at to find diamonds in the rough. Nor are they going to have the risk tolerance to invest in startups, knowing that the overwhelming majority of them will fail. And the return likely won’t be big enough to provide a meaningful diversification away from the core delivery business. As a care transformation play, the idea seems dubious as well—adopting new technologies and changing care processes is difficult enough for most health systems, without asking already overwhelmed caregivers to serve as a test bed for some startup’s “transformational” idea. Not to mention potential risks to patient safety or the quality of care. That’s not to say that health systems shouldn’t ever work with innovative companies. Better, though, to leave the vetting, incubation, and financial speculation to the real VCs. Give this a spin, you might like it. Just in time for warmer weather, spring break, and BBQ season, the Washington, DC-based group Ex Hex are out with their sophomore album, It’s Real, and it’s chock full of AOR-inspired arena rock that will make you want to crank it up to 11. Recalling the heyday of early-80’s radio rock—with heavy doses of reverb, big beats, and bass hooks—the all-female trio (led by former Helium frontwoman Mary Timony) pays homage to the likes of Cheap Trick, Thin Lizzy, and Heart, even going so far as use an amp designed by Boston guitarist Tom Scholz back in 1982. You’ll hear echoes of Joan Jett and Pat Benatar here, with a dose of glam influence as well. The songs are longer and more thematic than those on their 2014 debut Rips, many of them sharing stories of heartbreak, regret, and moving on from broken promises. But it’s the fist-pumping, sweat-through-your-denim rock that will stick with you, putting It’s Real in hot rotation for the coming summer months. Best tracks: “Rainbow Shiner”; “Tough Enough”; “Cosmic Cave”. Stuff we read this week that made us think. A new survey from nonprofit data repository FAIR Health showed that telehealth use skyrocketed 53 percent in 2017 compared to the previous year. In comparison, retail clinics and urgent care sites saw increases of 7 percent and 14 percent respectively, while emergency department use dropped 2 percent. While both settings experienced double-digit growth, telehealth use was greater in urban compared to rural markets. Adults aged 31 to 60 accounted for the largest fraction of telehealth use; however, their portion dropped to 44 percent from 56 percent of all visits in 2016, while pediatric and young adult use grew. Investigators analyzed a large claims database covering all Medicare and a large number of commercially-insured individuals to evaluate utilization and pricing of a range of emergent and outpatient care options. If anything, the study’s methodology likely underestimates telehealth use, as cash visits that didn’t generate an insurance claim were not captured. Telehealth use is growing in every geography and across all age groups, moving from a novelty to a cornerstone of access for many consumers. Health systems and physician groups who fail to offer virtual visits and digital communication risk losing long-term consumer loyalty to providers who do. This week saw the launch of a new series in JAMA that will surely be worth reading over the coming months. Intended to inform healthcare policy debates in the runup to the 2020 elections, the series promises to bring a mix of “scholarly viewpoints” and data-driven evidence to the national conversation on how to reduce cost, improve quality, and increase access to care. In a kickoff article published this week, researchers lay out the scope of the problem, providing a concise recounting of the facts and figures that describe the current state of play in US healthcare. The authors break down the $3.5T industry into its component parts, dissect how we pay for and consume health services, and review ongoing themes in healthcare reform. It’s an excellent primer on where we are today, and the work that lies ahead. A companion piece by Stanford academics Kevin Schulman and Arnold Milstein argues that the growing interest in “Medicare for All”-style reforms is likely to meet with stiff resistance from payers and providers, given entrenched interests and competitive dynamics, an insight no less true for being obvious. The new JAMA series provides an opportunity for healthcare thinkers to introduce fresh ideas and new policy solutions to the problems facing healthcare, rather than simply continuing to rehash old arguments and vilify “greedy” industry actors. What’s needed now are answers, not more analysis and finger-pointing—here’s hoping the new series can provide some. If you’ve recently been to New York City, you’ve likely seen the cheeky billboards and subway ads from online prescription and “personal wellness company” Hims, alongside others by Hers, Roman and Kick Health, which offer consumers the ability to get prescriptions online for erectile dysfunction (ED), birth control, anxiety, and hair loss without ever visiting a doctor. A piece in this week’s New York Times shows just how easy it is for a consumer to procure their drug of choice, while avoiding potentially “embarrassing” in-person interactions. After filling in questionnaires on the company websites, male reporters were approved for generic Viagra prescriptions from Roman and Hims, and a female reporter was prescribed Addyi, a female libido drug, from Hers. Some physicians have raised concerns about the safety of prescribing these drugs, which may have significant side effects, without requiring an in-person visit. They also question the online vendors’ ability to comprehensively evaluate patients for underlying risk factors that might be related to conditions like anxiety or ED. Even doctors working for Hims have raised concerns about the company’s loosened prescribing protocols and pressure to increase prescription rates, leading to calls for greater regulation and even closing down the sites. Hims, Hers and other online prescribers are taking advantage of a service shortfall created by traditional providers. Rather than just trying to shut these sites down, doctors should strive to provide better service and easier access, especially in situations where social inhibitions might deter patients from seeking treatment. Thanks for joining us for this week’s edition. Let us know what you thought of it—we’re always eager for your feedback and suggestions. Don’t forget to pass it along to a friend or colleague and encourage them to subscribe as well. And of course, let us know how we can be of assistance in your work. You’re making healthcare better—we want to help!